The transition from elegant velvet Little Lord Fauntleroy suits, kilts, sailor suits, and dressy short pants to casual sweat shirts and blue jeans or baggy trousers for boys is an interesting study in social history. A boy of today who wears trendy, comfortable fashions that he usually helps select could hardly recognise his counterpart of 100 years past. In an earlier era, he might have found himself outfitted in a delicate lace collar and fancy velvet knee pants, sailor suits or kilts. Even older boys would usually wear an Eton collar, large bows and long stockings. Parents at the time dressed formally and insisted that their children also dress smartly to reflect well on the family, and to demonstrate their often hard-won social status. Gradually styles changed in the mid 20th Century to more practical soft collars, short trousers and knickers, before the modern incarnation of sneakers, baggy jeans, label t-shirts and sweats . Our HBC website should charm anyone susceptible to the enchantment and beauty of childhood. It is also designed to be a storehouse of ideas and inspiration for those concerned with fashion and design and those interested children historical experiences from ancient times to our modern age. The fashions discussed and illustrated on our HBC (histclo.com) web site are fascinating windows to past eras. Fashions are constantly changing, although at a variable rate over time. Fashions reflect social attitudes, and are particularably useful because they are an observable phenomenon while the underlying social attitudes are not as readily observeable. Fashion reflects the modes and manners of the times in which they were made and worn. A careful assessment of those clothes can provide much additional information, including details on family life, evolving concepts of childhood, differing attitudes toward boys and girls, the status of children, and many other topics of social interest. The clothes illustrated in this web site should delight the eye and more importantly touch the heart. The more modern 20th Century fashions may even help you recall some associations with your childhood--hopefully bringing back many happy memories. Boys’ clothes have been fabricated from a wide range of materials: elegant brocades, plush velvets, lustrous silks, as well as taffetas, satins, printed, striped and flowered cottons and laces are but a few among the fancy stuffs of which these clothes were made. The luxurious materials supplemented the more common cotton, linen, and wool fabrics used in everyday wear. HBC (histclo.com) surveys the styles worn through history from every day’s casual to Sunday’s-best as well as christenings, school and party suits—down to every last detail such as coats, caps, hosiery, and shoes. Figure 1.--Mothers in the late 19th century dressed their boys in Little Lord Fauntleroy suits, fancy velvet suits with lace collars. Often the boys had curls or long hair and to balance such fancy outfits they would have their picture taken with decidedly boyish artifacts such as a toy cannon, or in this case an early tricycle. Parents, especially mothers, used to choose their sons' clothing until they were older teenagers; children had little choice in matters of fashion. Actually, boys until recently may have sneered at the very concept of boys' fashions as much as they objected to the items selected for them. Children, especially wealthy children, were often dressed in fancy, formal clothes—even for play. Modern children would find clothing common a century ago highly restrictive and uncomfortable. It would certainly inhibit an active child who wanted to enjoy the playground in the contemporary scene. Today, even very young children have a great deal of say in how they dress, many demanding expensive designer clothing. Children are major arbiters of fashion in the world today, and even very young boys have considerable influence as to which clothes are purchased for them. Boys no longer sneer at fashion as they once did. Many are now as concerned with fashion as the girls. With considerable disposable income, either through allowances, or for teenagers, part-time jobs, expensive design has become commonplace. The fashion industry understands this very well and eagerly seeks to supply these youth with what they desire. Informal styles are now in vogue with children rarely dressing up and, in many cases, only under considerable duress. Our HBC website takes a look at the development of boys clothes over the past 500 years, from 1500 to date. We are working on the ancient world and middle ages, but our focus is on the modern world. In some ways boys' fashions have made a stylistic full circle. Children for much of history, as late as the 17th century, wore clothes just like their parents with no consideration to childhood. Then special juvenile styles began to appear during the late-18th century. Age graded clothing was standard during the 19th century and first half of the 20th century. Children have returned to dressing in increasingly adult styles since the 1960s. And many adults have taken to wearing the casual styles preferred by children. HBC is not just a fashion site. We seek also to record the connexions between changing fashions and larger social changes which they may reflect. We attempt to capture what the parents and the boys themselves thought of the fashions of the day. There frequently was some disparity between what mothers and boys have wanted. Trendy fashions were not always popular with boys when the trends were mostly set by their doting mothers. Only in the modern era have boys generally gotten their way and set their own distinctive fashion trends. HBC is still under construction. In fact, our site is in a perpetual state of construction as visitors contribute their personal experiences and expertise. We invite you to provide your own historical and fashion insights as you visit the various pages—even if it is only a sentence or two. Many readers think they have nothing of vsalue to contribute. But in fact every reader has something to add because we are interested in in personal experiences. We would be especially interested in any memories you might have about your boyhood clothes and experiences concerning those clothes. Please let us know if you have any comments or additional information to add. The possibilities are endless. Perhaps you are knowledgeable about a specific style or period. And surely you know something about current fashions. 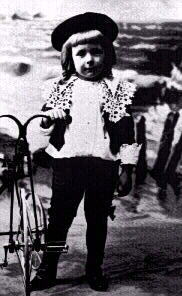 Maybe you have read a biography with interesting details about how a famous person was dressed as a child. Or perhaps you recall a movie or television show accurately depicting period dress. Any of this would make an interesting addition to our web site. Welcome to HBC. There are currently about 25,000 pages and more than 30,000 black and white and color images in the HBC complex. Most have never before been published. We have endeavoured to illustrate the historical context with actual images of the time. In many cases historical information is lacking and the images themselves have been utilized to assess fashion trends. We invite our readers to comment on these images and contribute whatever insights you may be able to offer. Such comments, even very brief ones, have made a substantial contribution to building to our site. There are several major sections of HBC. The largest and more important section is "Topics". Here we have developed the major subjects concerning boys’ fashions and archived information. There is, however, considerable information of importance in the other areas designed to better utilise, work with and locate the information you desire in the Topics section. You may want to investigate these other sections as well. The topics section heart of HBC. It is here that we archive the information that we have collected on boys' styles and fashions over time. This section includes the major subject headings of activities, advertisements, art, biographies, catalogues, chronologies, clothing technology, countries, events, families, hair styles, institutional wear, literary characters, patterns, photography and publications, reënactment, seasonal wear, style, theatrics, and uniforms. There are hundreds of further subdivisions under these headings. There are also satellite sites for presidential boys' clothing, royalty, and youth uniforms. Please read the introduction and then pursue what ever topic may interest you. Let us know if we have overlooked any topic of importance. The major objective of HBC is to better understand historical developments through a study of fashion trends. Our thesis: clothes are much more than utilitarian garments; they reflect larger cultural and social trends. In this section we take the information developed in the Topics section and attempt to analise the significance of the fashion trends. HBC does not believe that every twist and turn of clothing fashion is important; we believe that overall fashion trends do help provide important information about social and cultural developments. Based on the information collected in this website, several essays, appropriately illustrated, have been drafted to assess the trends in boys clothing over time and the significance of those trends. Issues addressed are the obvious, and more subtle, signals that clothes send and the messages that parents and children want to send. Since the appearance of specialised children's clothes in the late 18th Century, there have been three basic questions: 1) at what age should a boy be breeched and his curls cut; 2) what type of collar should he wear; and 3) should he wear short or long pants. The complications from these three basic questions are countless and the resolution of the issues were not finalised until the late-20th Century. There are also an extensive historical section here. Here are a variety of tools which can help you better utilise HBC. Some background is provided for academic research. The glossary is also an index that will help you quickly find pages of interest. There are also glossaries in several different foreign languages which can help our foreign readers navigate HBC. There are also many other ways to search or obtain information fom HBC. Here are a variety of activities which you can pursue on HBC. The activities will help you analise historic images or spend a few diverting moments. You might want to puruse some difficult images to see if you can offer some insights about them. Or, perhaps you might want to take our HBC quiz or even dream up a humerous caption to an image you found on HBC. At this time there are only a few such diversions, but we hope to add more as HBC grows. Please inform us if you can think of any other interesting activities. Some readers have asked about HBC. Here you can find some basic information about HBC. We have an introduction, FAQs, and a history of our site. We are also constructing a site index which many readers may find useful. We have also some suggestions about viewing HBC. If you have any ideas about other information readers may find useful, please contact us. HBC constantly adds new pages. Pages are added almost every day. We maintain a chronological list of new-pages which is updated regularly. This service is available to HBC contributors. HBC occassionally encounters technical problems. We do not like to bother our readers with messages on minor internet problems, but we thought it might be useful to have a place where readers can check for information on such problems, especially e-mail problems. Of course you can always send us an eMail, but we thought this page may prove useful. Here we are taking about internet problems and not actual substantive topics concerning historical boys clothing. We have tried to maintain HBC as a largly open-access site. The growing size of our site and especially the steadily increasing bandwith usage as our number of readers increases has made this impossible. We must request our readers make a small contribution to help maintain the site. The participation contribution is $25 annually. We hope you agree this is a small price to pay for access to the extensive archive. The contribution provides unlimited access to all of HBC, except the E-Book section. And it means your experience on our site will not be disrupted by distracting banners and pop-up advertisements. You will note that most of our displayed images have captions. Here, we try to point out interesting aspects of the various images. If you notice any interesting subject in an image that we’ve missed or you think needs to be highlighted, please let us know. Notice that another feature of many images is that you can click on them for more information about the style, period, or person involved. (You can tell images that are linked by the coloured outline.) Also note that some pages may have image boxes, but no image yet; that means that we are still looking for an appropriate image. You can tell if we do not yet have an image, rather than being a broken link, because the image does not yet have a caption. 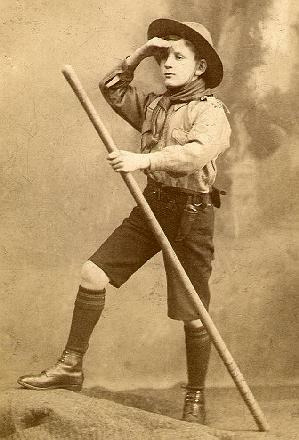 Figure 2.--The Boy Scout movement founded after the turn of the century played an important role in popularizing knee socks and short pants which were initially quite long. The shorts worn by the Scouts were adopted from the tropical uniform of the British Army posted in India beginning I believe in the 1890s. Thank you for your interest in our HBC website. We are very interested in hearing your comments. We are also looking for any historical material, articles on clothing, interesting passages from biographies/autobiographies, old-time photographs of your family, and personal memories of more modern clothing styles, or any other pertinent material. Perhaps you have some interesting ideas about further additions. We would greatly appreciate any new material you can provide. Do not think that you have nothing to offer. Everyone has information that can be useful. I know many of you will not have historical information, but we all have photographs and remember some of our favourite and least favourite boyhood clothes. Or, you can certainly recall favorite TV programmes and movies. All of this can be helpful in building the HBC site. HBC has had several different internet hosts. HBC takes adifferent approach to website building than most sites on the internet. We have decided to post our pages in draft form rather than to wait until we had a finalized research piece. We have done this so as to provid the information we have gatherd to readers now rather than at a later date when our research is completed. We have also done this so that we can include comments and insights from our readers. In many cases our readers and even casual visitors have made very valuable contributions to HBC. It has also allowed us to broaden the topics and countries covered to areas outside of the competence of HBC's own editorial staff. And in numerous instance these comments have affected the direction and conclusions in the page. We suggest that for best results that you view HBC using the Firefox browser. The pages should also display well on Internet Explorer and Opera. These three browsers are the ones that most HBC readers use. If you find problems with your browser, please let me know and we will be glad to check our codeing. HBC has had several different internet hosts. They have included Fortune City, Tripod, Hispeed, and USA Nethosting. The transitions over time have meant that HNC has had to make some organizational and codeing changes. This has has left us with some broken links. Most have been corrected, but if you encounter a broken link, please report it to us so we can make the needed corrections.